If you missed Shania on American Idol the first time, check out this "Best Of" show featuring all of this season's celebrity judges this Wednesday, February 3rd. The excitement begins at 9pm EST on FOX. Thanks. I've not only seen all of Shania's appearance, but all the rest I've seen at least a small part of except for Kristin Chenoweth. Pretty good I would say. Shania was probably the most attentive out of the guest judges. I had to laugh at the guy with the high pitched voice and Simon's response "Do you enjoy giving people pain" , also his response to another contestant "When you sing, do you find a lot of animals turn up outside the house". And what was with that girl pretending to faint and the tip-toeing guy? What a complete waste of the judge's time IMO. Last edited by amanda122 : 01-31-2010 at 06:12 PM. We've finally wrapped the guest judges on "American Idol." How'd they all do? One thing that hinders our judging of the guest judges is the fact that screentime is not always created equal. By our (extremely scientific) calculations, we've seen 2 1/4 hours of Victoria Beckham, 1.5 hours of Mary J. Blige, 45 minutes each of Shania Twain and Kristin Chenoweth, about 30 minutes of Neil Patrick Harris, 20 minutes each of Avril Lavigne and Katy Perry and about five seconds of Joe Jonas. Enough to judge how they did? It doesn't matter, we're going to judge anyway. 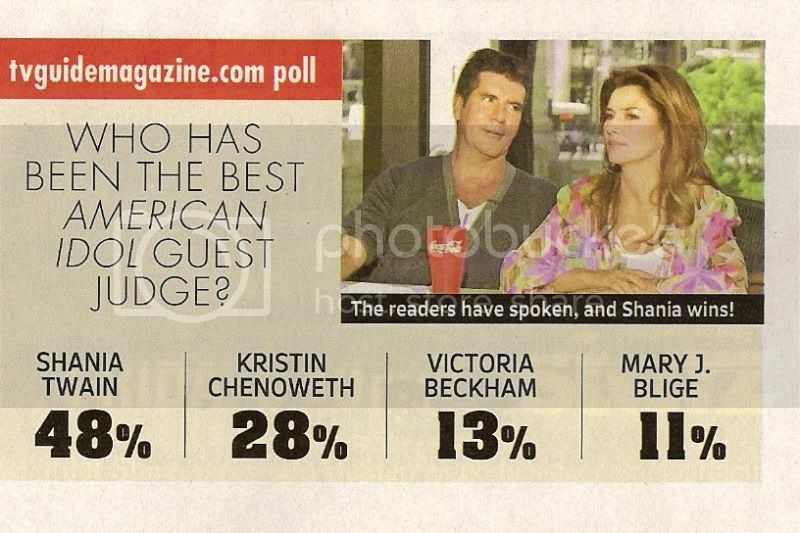 According to our guest judge polls, as of 8 a.m. PT Wednesday, Feb. 3, on a scale of Bad, Meh and Great, Victoria Beckham was the only "Meh," Mary J. Blige, Avril Lavigne and Katy Perry all got "Bad," Shania Twain, Kristin Chenoweth and Neil Patrick Harris all got "Great" and poor Joe Jonas got "I blinked and missed him." Those polls are actually fairly in line with our own feelings too, though we do think Mary J. was pretty amusing when she got the giggles. However, what this tells us is -- budget the guest-judge time more effectively! Victoria Beckham was fine. Nothing spectacular, but she had some interesting things to say. But not three hours of broadcast time worth of things. Likewise Mary J. Blige. Meanwhile, the combined total broadcast time of the three best judges (Shania, Kristin and Doogie) was 2.5 hours. And again with poor Joe Jonas. He said 40 words total in his stint on "Idol." Seriously. Here's where we will commend "Idol," though. It's been 8 seasons and yet this season feels totally fresh. Some of that is Paula's departure and Ellen's arrival, some of that is that it's Simon Cowell's last season. But some of it is the arrival of the guest judges! It made each audition episode (which is, frankly, our least favorite part of "Idol") new and interesting. We think they should definitely keep this format for next year, especially in light of the fact that Simon will be gone. However, we think they need a more judicious hand deciding who had the best appearance as a guest judge and mete out the airtime accordingly. Mary J. Blige, B- -- what some people thought was rude others found hilarious. Much like Simon. Joe Jonas, N/A -- 40 words, people. 40. What do you think? Do you agree with our assessment of the "Idol" guest judges? Avril did not contribute much? I would pretty much agree except that my opinion of Katy Perry was less. At times I thought she was rather rude to the contestants no matter if they were good or bad. She almost seemed angry at times. Just my observation. Avril seemed shy if that's possible for her. I don't really know why Victoria Beckham got so much air-time. I found her okay, but somewhat boring. Mary Blige was okay, but I thought she sometimes was being a little rude. What I saw of Patrick Harris was good. Didn't really see Joe Jonas, or Kristin Chenoweth, so I can't really comment there. Really? I thought Katy Perry was great (not as good as Shania) but I loved when Katy Perry pointed out that the show was about singing and "not a lifetime movie". Since all the open auditions are pretty much the same I thought I'd lump them all in one post. Call it American Idol in a Bowl. The guest judges varied in quality. Neil Patrick Harris was terrific. I'd like to think he didn't become the permanent new judge because he's got that day job and not because Simon realized he's too good. Shania Twain showed some personality and paid one hopeful the greatest compliment any singer could receive -- she liked his ******. By the way, have you noticed that whenever there is a good guest judge Kara just disappears? This is a huge improvement over incredibly annoying. More good guest judges please! Mary J. Blige looked like she'd rather be in Iraq. Katy Perry was refreshingly candid. She had no problem ripping people. If only she wasn't a worse singer than the contestants she crushed. She did have the best moment of the season so far when she called out Kara for liking some sad sack for their hard luck story, not singing. Katy said, "This is not a Lifetime movie, sweetheart!" Kara had no withering retort of course. Or she did and they just didn't show her saying, "I know you are but what am I?" Didn't see Kristin Chenoweth's turn. I'm guessing she was perky. Avril Lavigne was God awful. How can she judge talent when she can't even spell her own last name? It's L-e-v-i-n-e. She wore a devil hood. C-r-e-t-i-n.
For what inexplicable reason did they bring the vacuous Victoria Beckham back? They didn't have to pay for a meal per diem? She wore her hair back and in a bun and looked like Olive Oyl with bad eye shadow. But the worst ever was Joe Jonas. Proving his only talent is being in the Lucky Sperm Club, he just sat like a slug. For the longest time I thought he was just Kara's blow up doll. But then I always figured Kara was just Simon's blow up doll. The auditions were what you expected. Does every 23 year old contestant have an 8-year-old child? Is it possible to get put through to Hollywood if you haven't had a near death experience? If this is a singing competition why did Ms. DioGuardi and Ms. Oyl make one contestant take his shirt off? If they're going to do that, just put Tallulah Morehead on the panel. And while we're on the subject, I don't think the judges gave the guy wearing a bikini fair consideration. One recent contestant was asked to tell the judges something interesting about himself. He said, "I like cheese." When pressed, he also casually revealed that his mother had kidnapped as a child and they spent his formative years running and hiding. But I want to get back to that cheese thing. One night a hopeful just wailed painfully. No lyrics, no melody, just screeching. Ms. Oyl complimented him on his choice of song. No wonder they want her to guest on The View. Note to the 10,000 hopefuls in Los Angeles who desperately hope to get a trip to Hollywood -- you're ***** in Hollywood!! Meanwhile, a girl from Florence, Italy flew all the way to Denver for an audition. She couldn't go the ones in Boston and New York? Anyway, she is off to Hollywood -- probably with a layover in Taiwan. Thank God we've arrived at Hollywood Week. I hear talk that the other Jonas Brothers wanna guest judge. She gave people mean looks at times is all I meant. I didn't think that was necessary. But then I don't follow her anyway. Maybe that's how she reacts. For anyone who saw "The Road To Hollywood" Shania was on it for split seconds, and these might have been previously unseen clips. She comments about a girl with a guitar, and a guy belts out "Ain't No Sunshine" in front of her and the other judges. Here are some screen caps I made. You mean folks watched other than the Shania episode?! I've been tuning in most weeks just to see how the other guest judges fare and because it's Simon's last time on the show.